“I didn’t want the evening to end. I didn’t want to say goodbye to the group,” says Robin Glickstein. As many of us have experienced, giving feels good. But sometimes giving with others feels even better. That’s what Glickstein recently found, as she shared a unique and special experience with 11 others through a “micro-giving circle” at Rose Community Foundation called #MakeItHappen. In a giving circle or collaborative giving group, individuals, usually with a shared interest, come together to make charitable donations to causes they collectively select. Rose Community Foundation hosts several such groups with interests ranging from teen philanthropy, to women and families, to the Jewish community. Some groups are one-time, while others are ongoing. Glickstein participated in a one-time giving circle that awarded small, “micro” grants to individuals who presented innovative ideas for creating new Jewish experiences in their communities. The effort was part of an international initiative of the Schusterman Family Foundation called #MakeItHappen. A website collected ideas from around the world and Rose Community Foundation’s #MakeItHappen Micro-Giving Circle focused on ideas from the Greater Denver community. Rose Community Foundation and the Sturm Family Foundation each matched individual giving circle members’ donations to create a pool of $8,000 in grant funds. 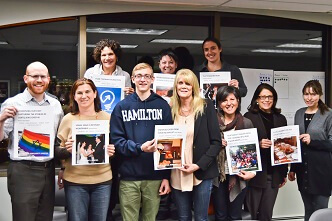 During a single evening, #MakeItHappen giving circle members met one another, reviewed dozens of creative ideas and together selected eight inspiring proposals to fund at $1,000 each. One idea the group chose to fund was from Moshe Rhodes. “I proposed a four-part Jewish delicacy baking series to help increase young adult Jewish involvement in Boulder,” explains Rhodes. Several months after awarding the grants, Glickstein and the giving circle had the opportunity to meet the grant recipients and hear the results of their efforts. They met Rhodes, who reported that his highly successful baking series drew more than 100 participants. “It was interesting to see who they were in real life, to feel their passion and to experience their outcome,” says Glickstein. Watch for more opportunities to join or start giving circles through Rose Community Foundation. Contact Sarah Indyk for more information at sindyk@rcfdenver.org or 303.698.4416.